Oil seep in Nicaragua - oil naturally seeps from the ground and can be seen floating on the water. 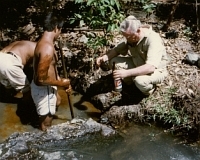 Harold Witcher is shown taking samples, with the help of local residents. Black Star 231 Corp. has devoted considerable resources to identify major new Areas of Latin America that are believed to hold billions of barrels of producible oil and gas. Black Star has worked with the high levels of government in Latin America to establish working relationships to aid and expedite future exploration contract proposals. Black Star 231 Corp. seeks to align with an industry partner to join with them to acquire concessions and drill the highly prospective areas already identified. 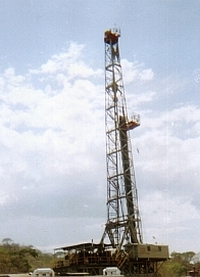 Drilling rig at the first test well in Nicaragua. 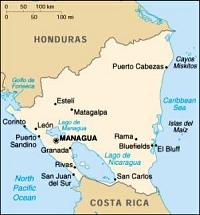 Black Star 231 has a major stake in Honduras through its Rose Dome Energy S.A. unit, Jim Pryor, served as Rose Dome's lead negotiator with the Ministers of the Energy and Environmental Ministry of Honduras, and with the advisory staff of the President of Honduras. This project has been temporally delayed pending the passage of a new National Hydrocarbon Law being crafted by the Honduran Congress. Black Star 231 has convincing evidence to support the existence of significant oil reserves in multiple sedimentary basins across Honduras. 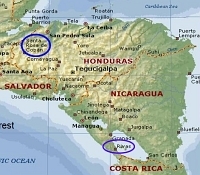 Jim Pryor was asked to hold a press conference at the Presidential Palace in the Honduran capitol city to announce the first onshore exploration in Honduras. Videos of the press conference attended by multiple new agencies can be viewed here.